Santo Tomas holidays promise peace and relaxation in an unspoiled resort. 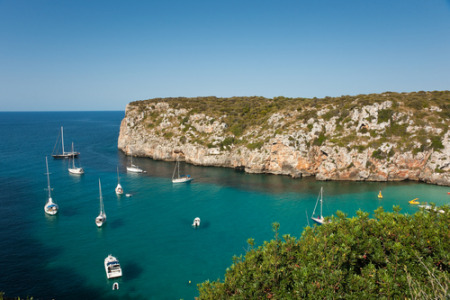 Located on the southern coast of Menorca, only twenty miles from the airport, it has a long narrow beach washed by clear, warm water. Holidays to Santa Tomas are all about relaxing in a guarantee of summer sunshine by day and chilling out under the stars at night. More active holidaymakers can try the range of water sports activities available from the beach. Holidays in Santa Tomas attract large numbers of families with young children as well as older couples. The holiday season is long, from April until the end of October, with summer temperatures in the low thirties. So if you are looking to escape the vagaries of our British weather, check out our cheap Santo Tomas holidays and you'll be pleased with what you find. With good accommodation, restaurants catering for all tastes, shops for essentials, and a low key nightlife, our low cost Santo Tomas holidays will help you leave your stresses behind. For further information, and to find our last minute Santo Tomas holiday bargains, use the search facility.